The Grand Excelsior Hotel is one of the most prominent hotels in Bur Dubai. Just minutes from the World Trade Centre, this stylish resort is a favourite among families and business persons alike. The contemporary, high-rise hotel exudes a harmonious blend of traditional Arabian style with modern conveniences. Along with four enticing restaurants serving an array of cuisines, this elite hotel offers a range of facilities including the relaxing Levana Spa complete with a sauna and steam rooms, a gym, a beauty salon, rooftop swimming pool and more. The 282 guest rooms at Grand Excelsior Hotel Bur Dubai are contemporary in design and provide guests with modern amenities to ensure a comfortable stay. If you want to explore more of the city outside of this elegant resort, a shuttle service is provided for transportation into tourist areas, and tour tickets and assistance is available at reception. 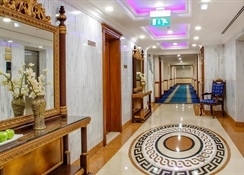 The Grand Excelsior Hotel is located in Bur Dubai. The hotel is within walking distance from the Textile Souk (2km), BurJuman Mall (2km), Dubai Museum (2km), Grand Mosque (3km) and The Dubai Heritage Village (3km). The closest airport is the Dubai International Airport at a distance of 7km from the hotel. 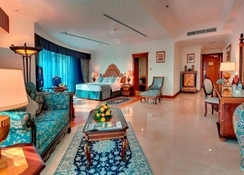 The rooms at the Grand Excelsior Hotel Bur Dubai are categorised as Premium Suite (One Bed Room), Executive Suite (One Bedroom), Studio, Family Room, Executive Suite (Interconnecting 2 Bedroom), Premium Suite (Interconnecting 2 Bedroom), Deluxe – Twin Bed and Deluxe – King Bed. In total the 282 rooms provide free WiFi, and 24-hour room service. For a bit of entertainment, LCD TVs come with satellite channels, and guests will also find coffee makers and free newspapers. The Grand Excelsior Hotel Bur Dubai has four restaurants and/or bars on-site, serving up varied cuisines. For International fare, you can head over to the Docklands Restaurant, with traditional Arabic, Indian, Japanese and Italian plates on the buffet-style menu. The Gypsy Chinese Restaurant is known for its tasty Chinese cuisine, naturally. Dugout Sports Bar is where you'll find classic pub grub and Dhow Café offers a selection of refreshments and pastries. 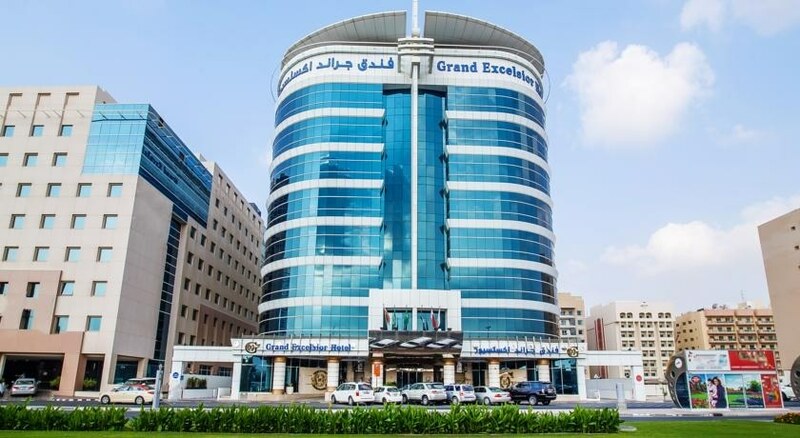 The Grand Excelsior Hotel Bur Dubai offers numerous recreational activities including a rooftop swimming pool, access to the Wellness Centre and Gym - which features the latest cardiovascular equipment, a relaxing Turkish bath, soothing massage treatments, a beauty salon, and more.